So what started out as two moto mamas wanting to invite some two-wheeled girlfriends from Instagram out for a moto-camping weekend in Borrego Springs in 2013, grew to a much larger gathering all because of social media. 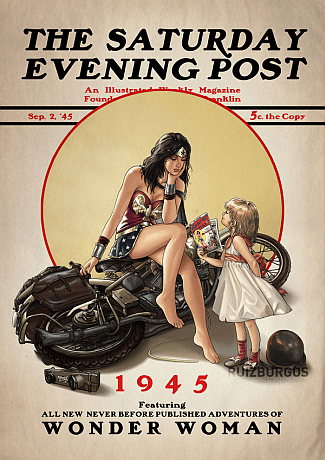 From a turnout of 50 the first year to the dumbfounding growth of 1700 by the 4th year moving to Joshua Tree for expansion means the founders might be on to something for the future of women in motorcycling. I had heard about the Babes Ride Out event from a few friends and thought I would give it a go and see what all the fuss was about. Plus, I was embarrassed to admit that this CA native had never been to Joshua Tree. So I really needed to go. I was torn between taking my VFR, or the sidecar. I wanted to show off the sidecar, and promote Ride for Kids, and I had a feeling there would not be too many sport bikes. ( I later found out that I was right. Almost no plastic was to be found) Since I can’t lane split with the sidecar, I decided to take the VFR, and this meant finding a way to load camping gear on my sport bike. Luckily over the years I have become so much better at packing light, but it did look a little silly with all that gear strapped on. The only uncomfortable part was riding with a small backpack chair. At first it kept hitting my helmet and I couldn’t look up enough, so that would have been dangerous. Frank helped me get it situated and I was finally ready to hit the Friday night traffic on the dreaded 91. 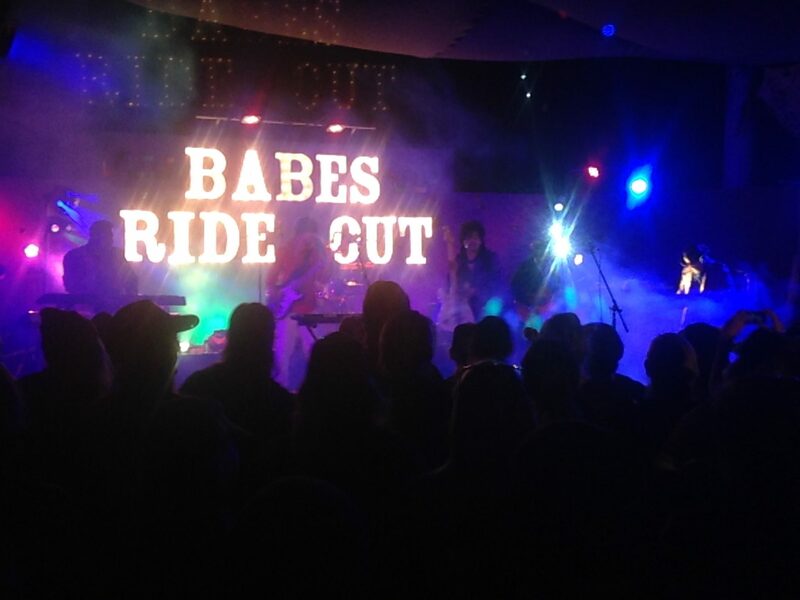 I unfortunately arrived in the dark, so it would not be until the next day that I would see all the beauty and oddity that was to be Babes Ride Out. Luckily my friend Sara gave me great directions to the location of their campsite and I parked next to them. I proceeded to walk down to the “village” area where there was food, drink, music and more. This would be the location of all the activities for the weekend. There was free 805 beer and Sailor Jerry, a Biltwell Brodeo, and mechanical bull riding contest, plus booths and fun from all the sponsors like Triumph Motorcycles , Progressive, Biltwell, ATWYLD, STANCE, Sailor Jerry, and 805 Beer,with support from Red Wing Heritage, Stetson, Vans Girls & House of Vans, SENA, Lowbrow Customs, Moto F.A.M, and more. Saturday morning came and sunrise meant I could revel in the enormous tent city that lay before me. I banded together with my fellow campmates in fixing a quick breakfast and planning our route for the day. There was a local art tour that we decided to go on, and we drove to a few galleries to enjoy the art, sculptures, and pottery from the local artists. My favorite was the carved gourds with carved wood inserts. Utterly stunning and otherworldly. I was also able to finally ride through Joshua Tree National Park. Such a unique area with a mix of flats, canyons, and crazy rock formations. I can’t wait to come back here again for camping and hiking. Saturday night meant food truck dining and the most amazing Prince Tribute band on the planet! This guy danced and sang and jumped and danced some more for over 2 hours. Such an unexpected powerful show. Everybody danced and sang along to all our favorite Prince songs. Another fun highlight of the weekend was being able to catch up with some of my sisters from the Sisters Centennial Ride. It is amazing to feel this unspoken bond with these ladies when you share a event like that cross country ride. It was definitely a Girl Power weekend. Sunday meant the end of the event and we all packed up to go home. They weather was also starting to look a little funky, and rain was already on the radar. I planned my route home a little different so I was able to stay dry most of the way, and avoid any downpour. I really squeaked by at the right time. I heard not everyone was lucky. My overall impression of the event was one of surprise and fascination. There were a lot more attendees than I was expecting. I loved the minimalism of the camping event. So great to see so many women come together to celebrate motorcycling. I met women from all over the country, of all ages, riding all types of bikes, from all walks of life. The only negative for me was that I was a little disappointed by the lack of proper riding gear by such a large majority of the ladies. I hate using the term hipster. but if there is an image that comes to mind, than the hipster clothing style was definitely the uniform of choice. Most were wearing thin jeans, tank tops or t-shirts, or denim jackets. The boots that were worn were super stylish, but not sure how they would hold up in a crash. I would like to hope that as we women become more empowered to spread our wings, we will also be motivated to protect them. Because lets face it, they are all beautiful. Until next year Joshua Tree and Babes Ride Out.